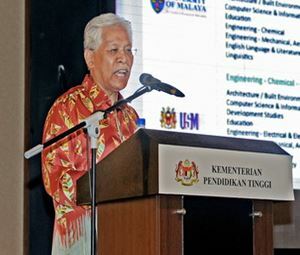 Five public universities will implement the 'Two Universities + Two Industries' (2u2i) programme in September, says Higher Education Minister Datuk Seri Idris Jusoh. Idris said five universities, namely UniSZA, Universiti Malaysia Kelantan, Universiti Putra Malaysia, Universiti Teknologi Malaysia and Universiti Kebangsaan Malaysia will implement the 2u2i programme for one course at their respective universities. Which specific course at each university? Hopefully the two years of industry training is alternating with two years of university learning. In other words, first year university, second year industry, third year back to university and fourth year industry again. Otherwise, it makes no sense to have two consecutive years of industry training after two consecutive years of university learning. No point for student working under low pay internship allowance for additional one year. If this is indeed the case, might as well shorten the bachelor's degree course duration to 3 years (2 years university + 1 year industry).